How is popular culture impacting us? That's the question asked tonight by Thomas M. Beaudoin, Ph.D.
Assistant Professor at Santa Clara University. Dr. Beaudoin was born in Kansas City, Missouri. He attended the University of Missouri, Kansas City as an undergrad, where he earned two B.A.s in History and Secondary Education (1992). The following year, he was a William Robertson Coe Fellow in American Studies at State University of New York, Stony Brook. He completed his M.T.S. or Master of Theological Studies at Harvard Divinity School (1996) and his Ph.D. in Religion and Education from Boston College in 2001. Dr. Beaudoin joined the Santa Clara University faculty in 2004 and teaches courses on the Christian tradition and Practical Theology. He is the author of Virtual Faith and Consuming Faith, and is working on a book concerning Ignatian spirituality and pop culture. He spoke tonight at Regis University in their Lenten lecture series. Catholics have paid little attention to culture, especially low culture. If we are to respect the dignaty of each person, we need to learn to tell parables in language they can understand. The little attention that is paid to culture tends to look at the intention of the producer of mass communications, what they are trying to express, or the nature of the audience they are trying to reach and what the communication says about it. A much more interesting and potentially helpful approach is to look at the meaning people take from the encounter with culture, the meaning the people poach one writer calls it. A Bishop told Beaudoin that one of the most wonderful things about mass is that people have the freedom to get what they want from the litergy. The official church has an intended meaning, litergial theologians can see the symbolism, but each person takes a different level of buy in, litergy is what we make of it. We write our own scripture, or any book, when we deeply encounter it and make it our own. Is this just encouraging the demoniac to rant? No, as Ignatius says evil is most effective when we engage in activities we can't talk about. It was a very engaging and thought provoking hour. Sunday, February 25th, 2007 from 12pm - 3pm. 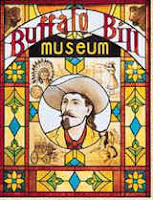 Celebrate Buffalo Bill's 160th birthday at the Buffalo Bill Grave & Museum. 987 1/2 Lookout Mountain Road Golden, CO 80401; 303-526-0744; www.buffalobill.org. People who care about the grass roots and neighborhoods should speak out about this now.